Northwest History: Did Dan Drumheller Murder an Indian in Early Spokane? Did Dan Drumheller Murder an Indian in Early Spokane? "Riverside Avenue in Stagecoach Days." 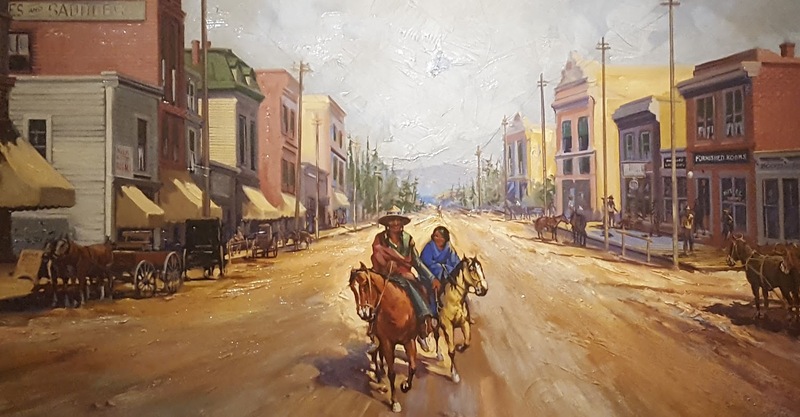 Painted by John Meinhart for the Exchange National Bank in the 1920s, this mural illustrates the nostalgia Spokanites of that period sometimes felt for the past. Currently on display at the Northwest Museum of Arts & Culture. Daniel Drumheller is one of our most colorful and fondly-remembered early white immigrants to Spokane. 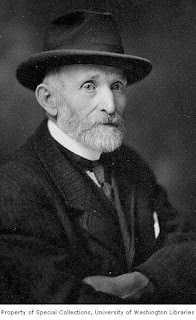 "Uncle" Dan rose from frontier man on the make to become a wealthy rancher, the founder of a bank, and mayor of the city from 1892 to 1893. He was a beloved figure in Spokane right up until his death in 1925, a living, storytelling symbol of the colorful early days of Spokane. Today there is a park named after him and his photograph hangs in the Spokane Club. The tales he spun to a local newspaperman were gathered up as a memoir, "Uncle Dan" Drumheller Tells Thrills of Western Trails in 1854. But he never told about that time in 1883 when he was charged with the brutal murder of an Indian man. 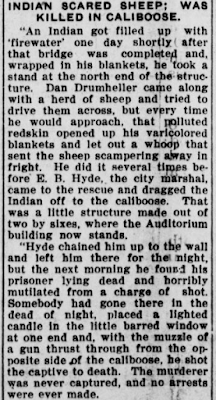 Short version: Shortly after the construction of the first bridge across the Spokane River in 1883, an inebriated Indian man played a prank by scaring Dan Drumheller's sheep. 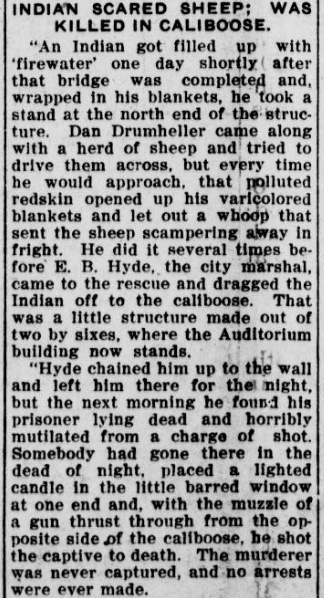 The man was arrested by Sheriff E. B. Hyde and put into the crude jail. The next day it was found the Indian had been murdered by a shotgun blast. The story reports that no one was arrested and there was apparently no attempt to solve the crime. A shocking tale--and one I had never read before. I looked for a confirmation of the story in some other places. It is not in Ruby and Brown's Spokane Indians: Children of the Sun. 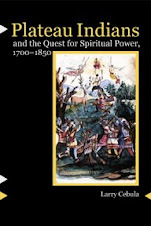 I cannot find it in Durham's early history of Spokane, nor in Jonathan Edwards' similar volume. The story of the murdered Indian does not appear in Drumheller's memoir--and you would think it would, being of the thrilling tales variety. There are no surviving arrest records from this time that I can find, so no help there. This contemporary article is very similar to the later version but includes some added details and differences. The article has Drumheller striking the Indian man with a stick, and the man returning with a rifle to threaten to shoot Drumheller. The arresting officer is identified as Deputy Marshall Gilliam. The wounds and the manner of the shooting are described in detail. The Indian man was not found dead, but wounded, and lingered for a while. The tone of the article is telling for the combination of unabashed racism towards native peoples combined with outrage that anyone had been so murdered while helpless and without trial. "It is hard to believe that a white man would be guilty of such an act of savagery," the editor frets, adding that "It savors more of the work of a skulking Indian." The newspaper then indulges in a long paragraph of racist vilification of the Indians, before adding "but that is no extenuation for the murder in question." The newspaper also states that "we doubt if the criminal is ever apprehended." That was not, however, the end of the story. 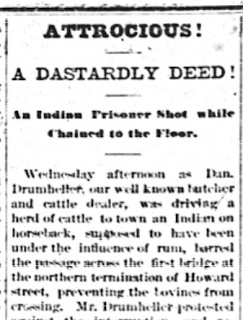 At the bottom of the column, the editor added a short update: "LATER.--Friday evening Mr. Dan Drumheller was arrested on a warrant sworn out by an Indian named Lewis, and released on his own recognizance. 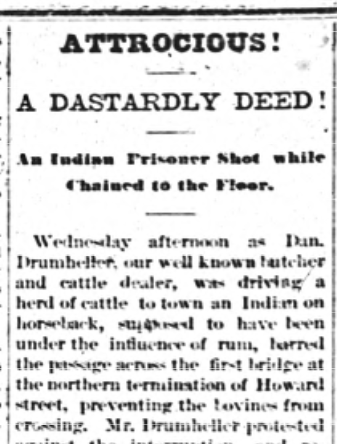 Of course no one believes that Drumheller was implicated in the shooting, but as he struck the man on the bridge the Indians have an idea that he must have desired the death of the prisoner." A week later the Review reported that the wounded man was "in a bad fix" and "slowly sinking with hardly any hope of recovery . . . in the Indian camp." 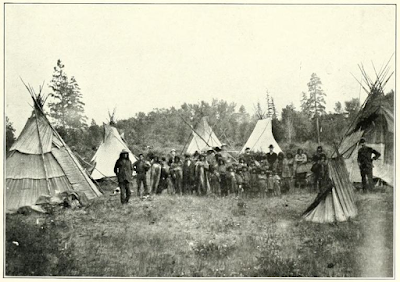 This camp might have been in what is today Peaceful Valley--see the photograph below. "There is no one in the community who excuses the crime," the story goes on, noting that a $200 reward was being offered and that "District Attorney Hyde has entered zealously into the investigation." An update at the end of the story noted "P.S. -- We understand that the Indian died Friday evening." the 1883 murder. The victim apparently died in this camp. The June 16 issue of the newspaper reported that Drumheller had been acquitted of the murder: "A number of witnesses were examined but nothing new was elicted." One wishes we had a more complete record of the proceedings. So was Daniel Drumheller guilty? I have no idea. He was charged, and he was acquitted. And though I have no faith in the court system of that time to provide justice for an Indian harmed by a prominent white man, that does not prove that he was guilty either. Without further evidence, we are left with a macabre mystery. Daniel M. Drumheller in 1900. What I find most telling about this case is how it has been selectively forgotten. Here in Spokane the dominant white culture tends to celebrate our early history. The first whites to make their homes in the region are still called "pioneers" or (worse) "settlers" and their colorful deeds are mostly celebrated. There are some aspects of that history that we are beginning to engage critically--such as the Wright campaign--and Spokane Garry is universally seen as a victim of white greed and double-dealing. What we rarely tell, however, are these stories of sharp violence meted out to individual native men and women. As I research, a whole series of shootings and lynchings and intimidations of Spokane Indians men and women are coming to light. These stories were known to everyone at the time they happened but have hardly made it to the history books--despite the sources being in plain sight. For this particular story, the selective amnesia might be partly explained by the identity of the only man ever accused of the crime. Good old Uncle Dan! I have a few other cases of this sort during this time period (such as the shooting of an Indian named Jackson in Cheney the same year). What I need to do next is to find more sources, perhaps with a clever reading of cemetery or land records, some of which survive. I also need to reach out to the Spokane and other are tribes and see if there are oral traditions of this time period that will help fill out the story. Thanks for sharing this sad but fascinating story. I am wondering if we could obtain a more complete record of the proceedings from the Spokane County Clerk? I have never requested any Superior Court records from Spokane County but I have been meaning to request a case that I am interested in. The last superior court case I obtained from Multnomah County, OR even contained transcriptions of witness testimony. It would be intriguing to see what testimony was given in this case. Judging from the terminology and names, this sounds like a case in the territorial court rather than the county court. For example, Squire Whitman is an old man by 1883. I can't imagine any reason, aside from being appointed as a justice, that he'd be in Spokane rather than Monmouth, Oregon. The latter place being where he dies a few years later.